The Sunnyvale Art Gallery is a cool place. I have done many open mic readings there. 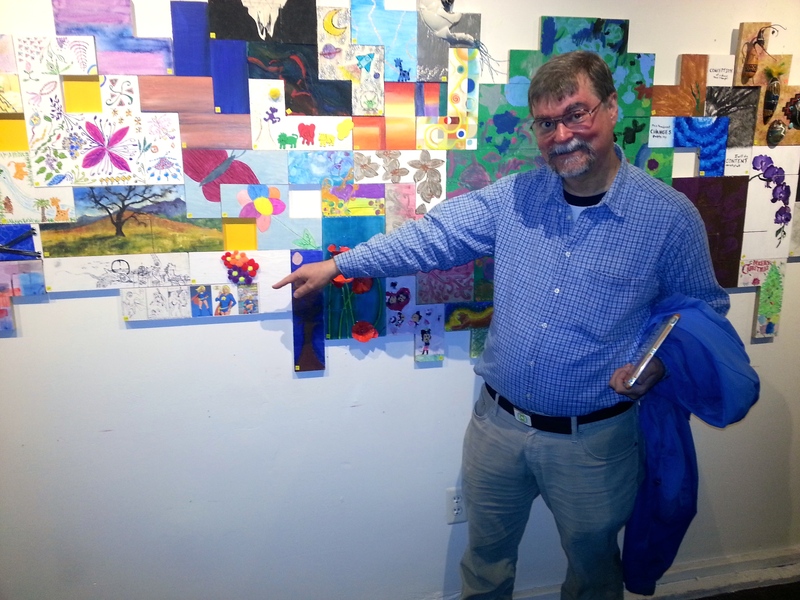 And from now until March 28 (closing reception is 7-9 pm 3/28), they have the Jigsaw Canvas art display. Super Holly Hansson is now in her first public art display. Here is how the Jigsaw Canvas is built. Artists get a small block of artificial wood upon which to put art: paint, ink, gourds, or in my case, several drawings of Holly printed on paper and glued onto the block. Now Batton Lash‘s artwork of Holly is on public display. If you are within driving distance of Sunnyvale, California, consider taking a look at the Jigsaw Canvas. And even contributing some art! As of now, the Jigsaw Canvas covers two very large walls. If you like a piece of the Jigsaw Canvas, and if the artist gave permission, you can buy it (the money will go to charity). I was there last Saturday, at the opening reception. I showed off the little part of the Jigsaw Canvas with Holly in it. I was feeling artistic. As artistic as an aspiring writer can get. Here is the Holly art up close. Thanks again to Batton Lash for doing this wonderful art for me. I drew his URL onto the left edge of the block: artists deserve credit! (I put the URL of this blog on there also.) If Batton sells one more book or comics due to the Jigsaw Canvas, I will be happy. I recently read “The Girl Who Would Be King” by Kelly Thompson. It sucked. In that it sucked me right in and I finished it fast and I enjoyed it a lot. Kelly does two first person points of view: the psycho supervillainess and the heroic superheroine. And it works. I rode in their heads, even though they were young ladies and I am nearly sixty. And I did not get mixed up as to whose head it was. This is enough to make me think about trying duo first person POV in my novel. Kelly says Josh Whedon is an influence. If you like Josh, I think you will like this book. And it often was a roller coaster. The character have super healing powers, which they use that a lot, since super strength fights do lots of damage when you are not invulnerable. I cringed nicely at well-described battle damage to hands, torsos, necks, and other neat stuff. The tone is grim, but a good kind of grim. Not the grim-cuz-gritty-is-cool stuff that infects way too many comics (cough, DC, cough) nowadays, this feels real. Well, as real as superpowers can get. A slight flaw: there were a few minor editing errors. Not a big deal. This book is a spicy candy bar. Eat it up. Last week, Marvel Comics published The Unbeatable Squirrel Girl #1. 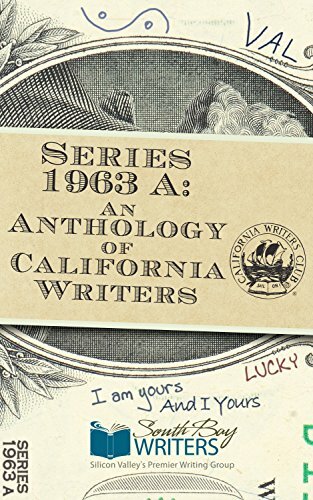 They have a letters page, in which the creative team said that, “This book is an experiment: can a book like this find an audience?” It found me, and I found it. What, a superhero comic book that is upbeat, happy, cute, colorful, funny, and not dark and grim and gritty? I remember that little girl in the comic book shop, her daddy should take her back and buy her some Squirrel Girl. A sweet role model who is NOT a princess! Let’s have more ray-of-sunshine hero(ine)s like THIS!!!! Squirrel Girl sings her theme song (sorta like an old spidery song in the 60s) in the first three pages while making a bunch of muggers “reevaluat(e) the choices that led me to a criminal liiiiiife!” And she beats Kraven the Hunter while mentally sipping coffee! And she’s gonna go up against big bad Galactus (who is most definitely NOT a cloud)! How cool is THAT? 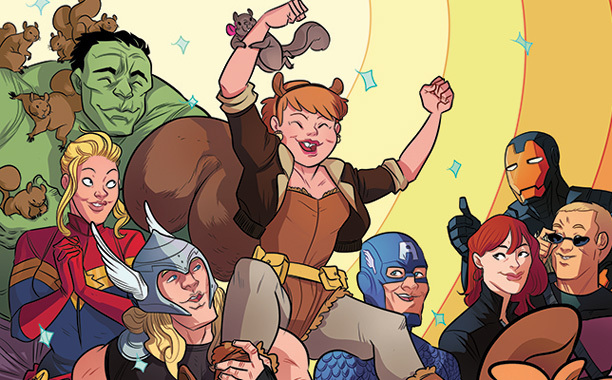 I am nuts for Squirrel Girl, and you should go nuts too! Buy her comic and make the world a happier place! P.S. It was sold out at my comic book shop, so I bought a digital copy. Did it through Comixology so I could have my digital comics all in one app. It looks great on my iPad Air. P.P.S. My 100th post! YAY! I just posted two complete stories under the Upcoming Stories menu. I intend to have them edited, and I will touch them up. Feedback is welcome: tell me what you like, tell me what you don’t like. But most of all, read and enjoy. The Poet and the Superspainer! Author Dave vs. Story Bloat! Holly’s super bad hair day story is way overdue for Kindle. And yet, I could not bring myself to push it out. Why? Bennie the Rubber Cop (based on Law & Order’s Lennie Briscoe, who deserves a full story and should not compete with Lash the barber in this story). The singing. That did not work. I could feel that as my older niece read. The super comb. Too much of a god-in-the-machine thing. I substituted a wire brush and big scissors. Probably I’ll cut the shampooing scene, but I still want to mention Holly’s love of strawberry shampoo. I hope to be way under 5000 words when I am done. Small enough that I can pad this story out with another short story. I have several in the works. I want my short stories to be quick and fun, like gobbling a candy bar. Or in my case, two at a time for a buck? I thought of story bloat after I saw the third installment of The Hobbit on New Year’s Eve. I liked it, but so much stuff was added to the original story! Sure, I like more of that cool and grand Christopher Lee! But it took Thorin FOREVER to change his mind, and what was with his silly hallucination stuff? I thought of story bloat before today. I got serious about it today. I made good progress, and I should have a tighter and happier story when I am done. It can feel good to cut. P.S. I agree with my friend Frank about the Hobbit part 3: the battle scenes were consuming (if a bit long), Smaug was fearsome, and anxiety was high. I will want Holly and Cal to fight dragons in a later novel. Smaug was not bloated, he was huge in the book. My dragons will need to be small enough that when they swallow a man (or a superheroine, hint hint) you can see the lump go down its gullet, yet large enough that you can saddle and ride one, and if you are fishing around for a body in the dragon’s digestive-juice-filled belly (with an air pocket at the top), it will take several scary moments to find the body. Yeah, I am writing ahead again, but this will be a GREAT scene. P.P.S. When I said today, I meant January 1.